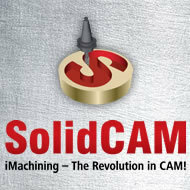 Kevin Kluver, Alexandria Industries: "It has also saved me at ton of machine time in the tooling area using the iMachining feature"
Terence Sammon, Mico Industries, Grand Rapids, MI:"The SolidCAM software is very powerful." ..I had some of the 'conventionally' trained die makers watch a block I programmed with iMachining and their jaws hit the floor when they saw how fast material could be removed on D2 tool steel! iMachining win against Competitor - 10 min vs 33 min.. ..He said to me : "iMachining is unbelievable - it really works very well. This is the first time I see something like that"
Finding Optimal Feeds and Speeds: "Other CAM programs are light years behind iMachining." ....Chief programmer Igor said: "I hope we get such results every day – we will have great savings in costs with iMachining 3D!!" iMachining vs. Competitor in Aluminum cutting - totally superior, completely another level! ..cutting this part in 20 min with your CAM system and I’m cutting it with iMachining in 6 min. ...tool looked nearly like new after about 2 hours of roughing!